New Minn. Court Handles Vets Accused Of Crimes As veterans with combat-related mental health issues like PTSD get caught up in the criminal justice system, communities across the U.S. are looking for new ways to help. Minnesota is setting up a special court to make it easier for struggling veterans to get the help they need. It's also training police to recognize the signs of a veteran in crisis. Third of a five-part series. Jonathan Wheeler, a former Marine who lives in Chaska, Minn., suffered combat-related mental health problems. 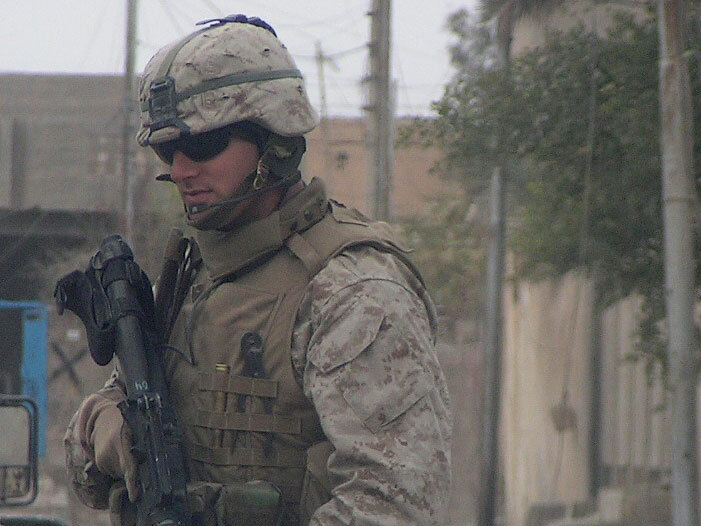 He says he couldn't quiet the demons that haunted him for years after his deployment to Iraq. 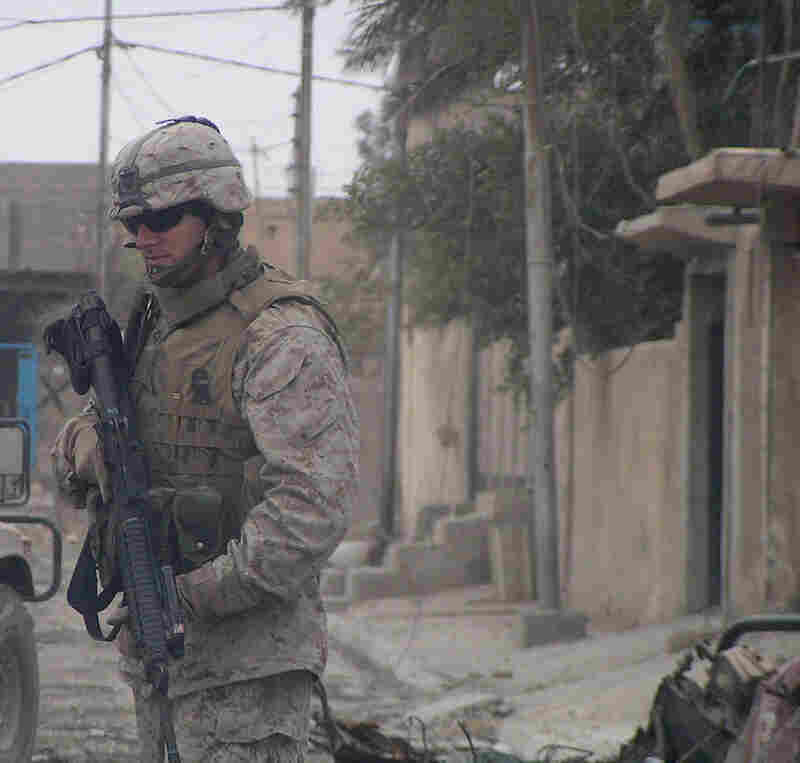 The Pentagon estimates that as many as 1 in 5 of the more than 1.6 million veterans who have served in Iraq and Afghanistan will suffer from mental health problems. As some of these vets get in trouble with the law and become entwined in the criminal justice system, states are looking for new ways to help. In Minnesota, a special court aimed at helping vets avoid jail time will launch this summer, and police officers are being trained to identify veterans with combat-related issues before they end up in court. Former Marine Jonathan Wheeler lives in Chaska, Minn., about a half-hour southwest of Minneapolis. With his two young children napping in an upstairs bedroom, the house is quiet. But Wheeler says the house is full of painful reminders of a more turbulent time. Standing 6-foot-6, he opens a sliding closet door that he ripped out of the frame recently in a violent rage. He's not proud of it. "Stuff was broken everywhere," he says. "Pictures that used to be hanging here are gone because I broke them. This one here -- I shattered it, broke it in front of my wife and my kids." Wheeler says he wasn't able to quiet the demons that haunted him after his deployment to Iraq six years ago. When police pulled him over one night, they found drugs in his car, and Wheeler was thrown in jail. After a string of angry, drunken incidents, he was diagnosed with post-traumatic stress disorder, or PTSD, and a possible traumatic brain injury. But it took five years for him to get help. A group of judges in Minnesota hope to make it easier for struggling veterans like Wheeler to get the help they need. This summer, they're launching a new Veterans Treatment Court in one of the state's largest counties. Like drug court or mental health court, veterans court requires defendants to follow a strict program and uses peer mentors to help them stay the course. Judge Richard Hopper says if they do, they get the benefits and services they need and the chance to skip jail time. "It's a carrot-and-stick approach, which has been very, very successful in all other parts of the criminal justice system," he says. At least two dozen Veterans Treatment Courts are operating around the country. Most of them have a good track record of dramatically cutting re-arrest rates. Veterans from any war are eligible, as long as prosecutors and defense attorneys agree to send them. Those who are accepted to veterans court stand to gain a lot. Judge Hopper will tailor each program for each defendant based on their particular situation. "In exchange for their cooperation and success in the program, they would get a better disposition in the criminal case," he says. "It may be a complete dismissal, a better kind of probation or a lesser charge." And defendants get medical or psychological care, housing, a job and anything else they need to stay out of trouble and lead productive lives. Col. Eric Ahlness with the Minnesota National Guard says the new court is a chance to make up for past mistakes. "If you look at the Vietnam-era veterans, where nothing was done, they have an inordinately high number of people who are homeless, have chemical dependency issues or are incarcerated. So if we do nothing, we know what the results are going to be, whereas this here provides a model that shows success," he says. But advocates say it's even better to help veterans before they land in court. At a training session in Lakeville, Minn., more than a dozen off-duty police officers listen as Officer James Stevens explains that they're often the first contact for a person in crisis. "You pull somebody over for a headlight out and he flips out on you, you might be like, 'OK, this is kind of weird,' " he says. Stevens tells officers to look for clues that a veteran might be struggling to adjust to civilian life. He gives them pamphlets on where veterans can get help. But it's not a get-out-of-jail-free card -- if a veteran breaks the law, trainers say, police should still make an arrest or write a ticket, like they would for anyone else. But Officer Shawn Fitzhenry encourages them to also follow up with prosecutors. "Do you throw the book at them? That is up to your discretion," he says. "However, if we can recognize that there is an issue there from overseas, that is going to help evaluate where they are at and how we can get them appropriate help." The idea is to reach them on low-level offenses, before things get more serious. Officer Fitzhenry remembers one call that nearly ended tragically. He arrived to find a veteran outside his house pointing guns at police while his young daughter watched. "He had two weapons pointed at us. The reason why he didn't get shot immediately is his daughter was on the front steps," Fitzhenry says. Eventually, the man dropped his weapons and surrendered. Later, police discovered that the guns weren't loaded. To help police avoid close calls like this, more than 90 departments across Minnesota have held the training sessions focused on veterans. The trainers don't want to repeat mistakes that they say were widespread when Vietnam veterans returned from combat; many veterans of past wars who have committed crimes cycle through the criminal justice system without any special treatment.